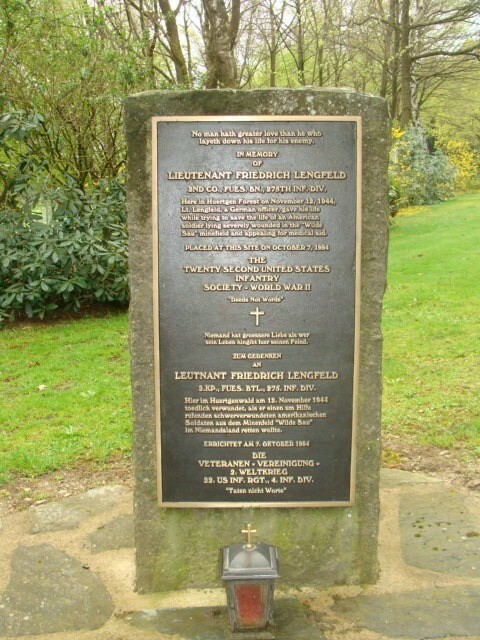 Later that evening, the US 12th Infantry captured the lodge, causing Lengfeld to lose more men. Rallying around him, they launched a counterattack and managed to drive the Americans out the following morning. As the Americans retreated, one of them ran directly into the Wilde Sau with disastrous consequences. Though severely injured, the American survived and began calling out for help. Beside the minefield was a safe path guarded by a German machine gun. 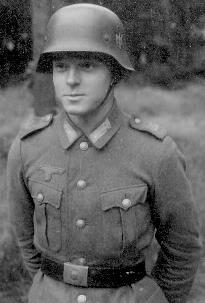 Lengfeld ordered Hubert Gees (a rifleman and his communications runner) to go to the gunner and tell him not to fire at any Americans who came to rescue the man. Hours passed and no one came for him, either believing he was dead or because the Americans had retreated in disarray. Unable to take the man’s cries any longer, Lengfeld decided to mount a rescue himself. This photo was taken beside the memorial facing south toward the road where the incident happened. Lengfelled walked along the area marked by the yellow line to get to the American soldier (blue X). 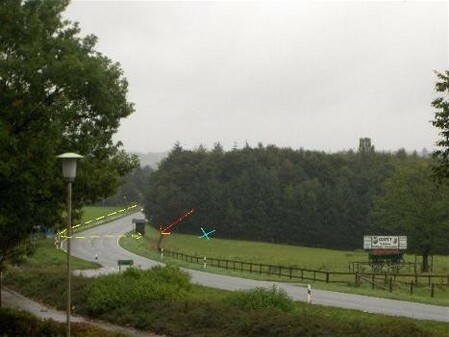 As he got off the road, he stepped on the mine indicated by the red arrow. The lodge was located beside a road protected with antitank mines the company had placed and knew the locations of. 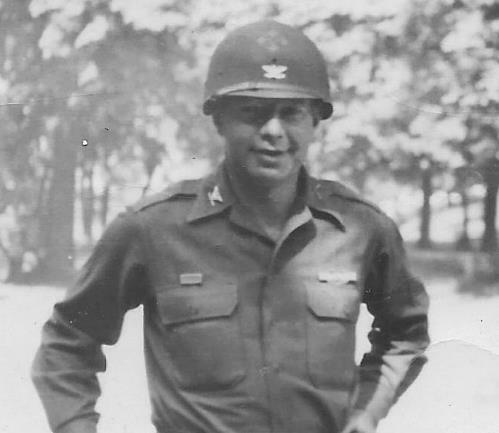 At around 10:30 AM, Lengfeld led a team of medics beside the road till he got opposite the American soldier. He then went into the minefield, but as he got off the safety of the path, he stepped on a hidden anti-personnel mine which blasted him away. They quickly carried Lengfeld back to the lodge, but it was too late. There were two deep holes in his back, and he was suffering from serious internal injuries. They managed to get him to the First Aid Station in Froitzheim where he died later that evening. The identity of the American soldier remains unknown. The Battle of Hürtgen Forest was one of the longest battles fought in WWII, lasting from September 1944 until February 1945 at a cost of some 33,000 American lives and about 28,000 German ones. Despite this, Ruggles felt compelled to honor Lengfeld’s heroism during the battle’s 50th anniversary. And that’s why veterans of the 22nd US Infantry Society set up a monument in his honor at the cemetery.